Just started my part-time MS of Strategic Design and Management at Parsons this week. It's been a bit hectic figuring my schedule because my Thursday section was cancelled, but I think I've landed on a final schedule! I'm really interested in this course because it's directly related to what I'm doing right now. Our Week 1-2 readings involve Lean UX and Getting to Yes. The projects seem to involve service design and I'm excited to form and meet my team because I'll be able to practice skills I will hopefully be able to take to working with project teams in the future. This is a higher-level class that focuses on the firm-level. During my first class, we had a roundtable discussing the ideas of sustainability and how there is a tension between being able to last and adapting through changes. This is a toughie because older companies tend to have legacy systems that are resistant to change...so is the solution to work with younger companies or tech companies that embrace innovation? New Economies embraces strategic design at a macro level --the economy. During the first class, we looked at a nonprofit's business model and whether it would work in a corrupt country. We considered systems and how design might be able to play a role in effecting a change...whether a small change can make a big change. Or whether big changes can effect wide-scale behavioral changes. There's been a lot of reading this week and I feel that I'm learning a lot of economics and theory. I was a women's studies major, so my background about econ basically involves friends who wanted to be econ professors. My program is a creative business Masters Degree, so I get the best of business chops in design school. How do you facilitate design thinking? 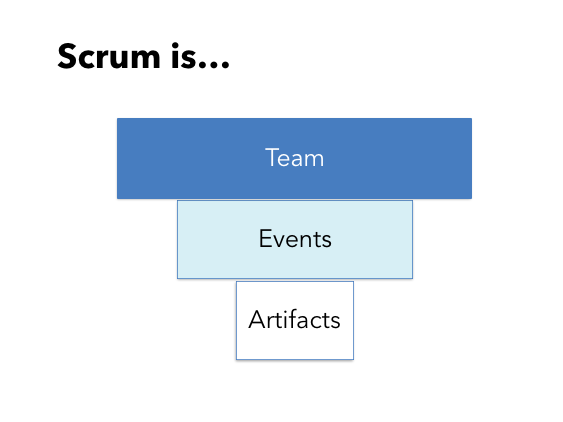 Scrum is made of a Scrum Team + Scrum Events that deliver Scrum Artifacts. The Scrum Team is made of people/roles who attend Scrum Events (i.e. Sprint, Sprint Planning) to create Scrum Artifacts (i.e. a Product Backlog). There is a funnel effect because if there is no Scrum Team, there will be no Scrum Events, and no Scrum Artifacts will be created. That's why we focus on the Scrum Team. The People. And this is why Scrum is Human-Centric...and user experience is integral. Where does UX fit in Scrum?